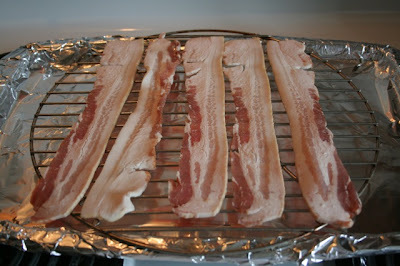 I have had a few requests asking about how we cook our bacon without making a huge mess. I am not a big fan of grease splattered everywhere, and while I LOVE the smell of cooked bacon, I don't love my house to smell like bacon for days. We bake our bacon. Yep...that's right, we bake it. In fact, I have only cooked bacon in a skillet once and was so irritated by the greasy mess that it created I have since steered clear of cooking bacon on the stove top. 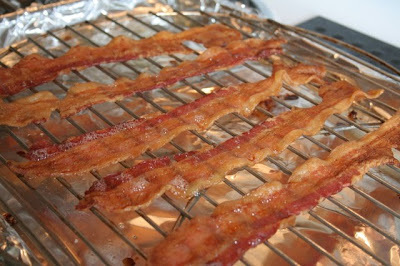 To bake your bacon, simply preheat your oven to 400 degrees. 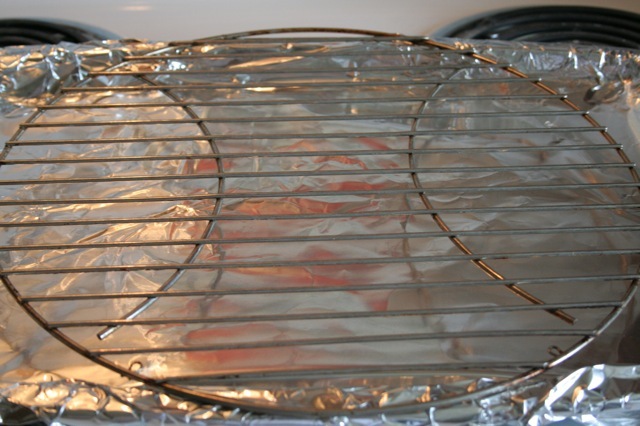 Cover baking sheet with tinfoil (be sure there is enough to wrap around the edges for easy clean up). Place cooling rack on baking sheet. Place bacon on rack (We only needed a small amount when this pic was taken. You can fit quite a bit if needed). Bake for 15-20 minutes or until desired crispiness is attained. I also turn on the oven fan to capture some of the smell. 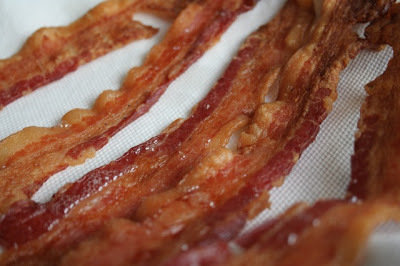 Place cooked bacon on paper towel to drain. Let baking sheet cool a bit then wrap up tinfoil and discard -- without the greasy mess! You can also put paper towels on cookie sheet to soak up grease and then wrap up and discard. Voila! Baked bacon with no mess. Now go bake some bacon! Anyway, we've loved this method! Found you form Metropolitan Mama. Sounds like a great idea. We normally cook our bacon on our George Foreman grill. That way there is a lid on top and much less grease get everywhere. You are so smart! I am definitely going to try this. I like bacon, but can't stand the mess it creates. Your post solves my predicament! We have started doing the same thing recently. If I'm doing a small batch, I'll even do it in the toaster oven.